George Groves inflicted the first loss of James DeGale's professional career to win the British super-middleweight title after a gripping bout in London. The fight started slowly but came to life and ended in brutal fashion as both slugged it out until the end. 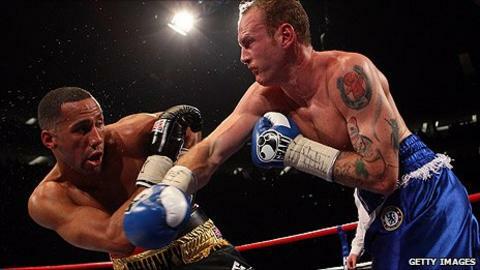 Groves, 23, was wobbled in the third and was cut badly in the 11th but boxed stylishly throughout to earn victory. Unbeaten Groves earned a majority decision, one judge scoring it 115-115 while the other two had it at 115-114. In contrast to the explosive build-up to the fight, the first round at the O2 Arena was cagey and tense with DeGale, who was booed on his way into the ring, shading it by landing the only scoring shots and ending with a sharp left jab. Whether it was respect or more likely nerves, neither boxer seemed to settle in the opening minute of the second round with both throwing just single shots. But Groves improved as the round wore on and landed a decent right on the bell. The fencing and feinting continued into the third before DeGale landed a right hook to the top of the head of Groves, who responded with one of his own while also later throwing two jabs that found the target. It was a fascinating start to the contest which Groves had just about shaded but he appeared marked below the right eye. Groves continued to impress with two-punch combinations and seemed to be in control of the fourth round but a solid left hook in the final minute wobbled him and DeGale unleashed a cluster of punches to finish on top. DeGale took a strong right hand at the start of the fifth and Groves' footwork was proving frustrating for his opponent who chased but could not catch his rival. Groves then landed a further right that appeared to hurt the tense-looking Olympic gold medallist. It was another quiet start to the sixth that drew boos from the 19,000 crowd, and that seemed to spur on DeGale who landed a big left that hurt Groves. DeGale followed that up with another left as he tried to assert himself and he continued on the front foot, landing a quality straight left on the bell. DeGale began the seventh round confidently as Groves' defence continued to drop lower but he still managed to land a clubbing left. DeGale responded with a left of his own with his punches seeming to hold more power and the round ended with a left uppercut from the British champion. A straight left from DeGale rocked Groves and sparked the Commonwealth champion into life but despite boxing much of the eighth round on the front foot he failed to land a meaningful punch. Groves boxed behind his jab in the ninth, inviting DeGale to box on the front foot. There was a flurry of punches and after a clash of head a cut opened up above the left eye of Groves. The final minute of the ninth round was the most entertaining of the fight with both boxers opening up as DeGale rocked his opponent with 30 seconds to go and then, just before the bell, had him wobbling with a huge left, which had Groves desperately holding on. Groves still appeared dazed at the start of the 10th but found success with his jab, although his punches appeared to lack spite with DeGale looking the more dangerous fighter. In the final minute of the round they again trade punches, with Groves taking a big right hook to the side of the head, and both boxers went to their stools with bloodied faces following a brutal exchange. With two rounds to go the fight was in the balance, and another clash of heads resulted in a huge cut opening up on the forehead of Groves which attracted a lot of attention from the referee. Perhaps sensing the fight could be stopped, Groves opened up and DeGale showed great skill in picking off his opponent who looked desperate and battered. But Groves battled on despite cuts on his forehead, left eye and right cheekbone and DeGale hurt his opponent again with a left but they again traded and landed in a contest that was turning into a classic. Going into the final round DeGale looked the fresher, but Groves landed more scoring punches, with both boxers knowing they needed a big performance to secure victory. DeGale landed a right but his momentum was checked by a big right uppercut from Groves. However, it was the British champion who ended the fight on top, opening up against a tiring Groves and they slugged it out right until the final bell. The decision was contentious with Groves earning his 13th straight victory while DeGale, who disputed the decision, suffered his first defeat in 11 professional fights. Groves, who also beat his opponent as an amateur, was content to prove the doubters wrong and claimed he would be willing to fight DeGale again. "Everyone was raving about him. Only two favoured me in a boxing news poll, but I have self belief," he told BBC 5 Live. "It feels good. I knew I'd won. I knew I'd done enough." He added: "I will fight him again yeah if everything is all right and it's the right way. But now I have beaten him twice." Earlier, middleweight Billy Joe Saunders inflicted the first stoppage of veteran Kevin Hammond's career to win in two rounds. While Frankie Gavin won the vacant WBO Inter-Continental welterweight title on points after a relatively uninspiring performance against the negative Young Mutley.